Ready to travel into the 21st century version of the 31st century? We’ll be spending some time with DC’s largest, most unwieldy, most drama-filled super-clique, as realized from the pens of writers like Mark Waid, Geoff Johns, Brad Meltzer, and Jim Shooter. Along the way, the book itself will repeatedly change titles and survive a Final Crisis. By 2004, the Legion had been a continuity mess and a completist's nightmare for much of the previous 15 years, with many overlapping series of various lengths. Paul Levitz and Keith Giffen's early 80s glory days had faded in the post-Dark Knight Returns world of gritty comics. The prestige Legion series (volume 3) which Levitz had inaugurated to much acclaim came to its end with issue #63 (1989), the aptly titled “Where Has All the Magic Gone?” which laid waste to the entire United Planets in a set of nine panel pages straight from Dave Gibbons' Watchmen playbook. Later in 1989, Legion of Super-Heroes (Volume 4) launched with a story by Keith Giffen and Tom and Mary Bierbaum, and art by Giffen and Al Gordon. This was the “Five Years Later” era, again full of nine panel grids full of grim adult Legionnaires still traumatized by the final Levitz story. The practice of a "soft reboot" jumping several years ahead to reset the character dynamics and story world was not as common then as it has become since then, in all sorts of media. 1989 also saw the launch of the L.E.G.I.O.N. series (writing by Giffen and Alan Grant; art by Barry Kitson and Mike DeCarlo) which re-imagined half-a-dozen of the 30th century’s finest as modern day space adventurers rather than teen heroes with a clubhouse. Its title changed every year: 89, 90, etc. These two series were joined in 1993 by the more traditionally heroic Legionnaires (Written by the Bierbaums; art by Chris Sprouse and Karl Story) which kept "Boy/Girl" names but ditched Silver Age “Lad/Lass” names, as seen below. Chameleon Boy became the genderless Chameleon, which makes sense for a shapeshifter. and has been generally retained since then. Let's review the set-up within the broader DCU which led to a complete Legion reboot in 1994. As discussed in the Final Crisis thread, Armageddon 2001 was a 1991 event whose plot was a pretext for a series of annuals showing possible "ten years later" futures for a variety of characters. The frame story involved a mystery villain called Monarch, who was supposed to be revealed to be a future version of Charlton's Captain Atom gone bad and returned to the present to ensure that his heel turn came to pass. But the mystery was spoiled by a leak at DC, so TPTB decided to change the ending, making Hawk (of Hawk and Dove) the future Monarch. Then came the death of Superman and the subsequent “Reign of the Supermen” event during which Hal Jordan was driven mad by the destruction of Coast City. In the “Emerald Twilight” story, Jordan dubbed himself Parallax, murdered most of the other Green Lanterns, and claimed the Oan power battery for himself. Dan Jurgens’ 1994 series Zero Hour: Crisis in Time! sought to unite all of DC’s disparate alternate timestreams into a unified whole. When Hal Jordan attempted to erase the destruction of Coast City from the timeline, the original Legion of Super-Heroes future timeline was destroyed as well, erasing all their continuity from their 1960s debut onward. Sweethearts Lightning Lad and Saturn Girl got the last word. This was the end of the L.E.G.I.O.N. series and cleared the decks for a reboot written by Mark Waid and Tom McCraw, starting with issue #0 between issues #60 and #61 of the 1989 series. This story restarted the Legion from scratch using the heroic (but renamed) characters from Legionnaires, depicting an attempted assassination of R.J. Brande foiled by an athlete (Cosmic Boy), a Science Police recruit (Saturn Girl), and an adventurer (Live Wire). The Legionnaires series (only a year old at this point) continued as part of the reboot as well, again with Waid and McCraw at the helm. Legionnaires and Vol 4 of Legion of Super-Heroes both lasted until the year 2000, when a space rift transported many of our heroes to a faraway star system a la Star Trek:Voyager. This was followed over the next twelve months by the maxi-series Legion Lost written by Dan Abnett and Andy Lanning; art by Oliver Copiel and Lanning. Live Wire ultimately sacrificed himself to kill a monstrous Omniphagos and return his friends home. Then the six-issue Legion Worlds caught up with Legionnaires who hadn’t been among those teleported far away. Are we done yet? Nope! 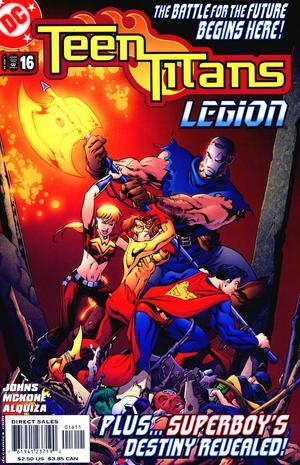 The end of 2001 saw The Legion, a new series by the Legion Lost creators, continuing where it left off and running for 38 issues, until late 2004. Finally (for our purposes), Mark Waid helmed a new Legionnaires book beginning in late 2004. Did he justify this “Threeboot” with a story? Yes, he did, and it began with a Teen Titans crossover. Creative Team: Geoff Johns writing. Mike McKone on pencils. Marlo Alquiza inks. My Two Cents: The purpose of this current Titans crossover is to introduce an alternate reality element that will justify the Threeboot. It also sent the Titans into an alternate "Titans Tomorrow" reality upon their return from the future. Beast Boy finally makes the Karate Kid joke that fans have been making for decades. I had no idea there was a Titans/Legion crossover... I got Waid's stuff in trade... and I was really following much DC at the time. Little confused about your description of L.E.G.I.O.N. ; are you saying they reimagined the 30th Century characters or set the comic in the 30th Century? As I recall, it was set in the present, though many of the characters are ancestors of the future Legionnaires. I read the first trade of Waid's earlier Legion Vol 4, after heaving given up with Legionnaires (I read it for a bit, at the start; but, lost interest, eventually). I tried; I really tried the whole 5 Years Later...; but, just found it so oppressive and dire that I just couldn't stomach it. To me, Legion is like Superman; you can have darkness going on around them; but, they are the light shining against the darkness. You just can't do them grim and gritty. I loved Sprouse's art, thought and the Bierbaums were darn good Legion writers (and really nice people); it made a nice change from what had been going on in the regular series; and, I loved SSprouse's redesign's, giving the Legion a more unified look, while keeping their individual costume and character elements. Waid started well; but, I didn't continue past that first trade. I think it was just part of mu general drift away from mainstream superhero comics, as they all felt repetitive, to me (with some exceptions). I thought it was good; but not especially noteworthy. I had read the classics, already. Karate Kid was released in 1984; they couldn't have been waiting too many decades to make that joke. Don't make me feel older than I already do. Surprised he hasn't been replaced by Young Master MMA, or something. I always wondered, though; if Ralph Macchio was the Karate Kid, did that make Elizabeth Shue Princess Projectra? You are correct. I goofed. Wally was wearing red at this point, right? My knowledge of L.E.G.I.O.N. is second hand, so I am sure you are correct about the present day setting. Yeah, he started wearing red right after Crisis. Creative Team: Geoff Johns and Mark Waid writing. Ivan Reis and Joe Prado pencils. Marc Campos inks. The Story: Fighting a losing battle against five hundred foes, the Legion and Teen Titans retreat to their old base on Earth to regroup. As the plan is enacted, the Fatal Five (Hundred) storm the Legion base, but after a big battle, the Cosmic Treadmill activates and sends them all home. In the process, the Legion and the Titans are sucked out of their reality into some Space Between. The Titans and Connor Kent are able to get back to their own time period—or rather, ten years in their future. My Two Cents: The story reaches its desired conclusion, setting up a new future in which Mark Waid can explore a new set of Legion stories in a world where teens and adults are at odds, and Legion fandom occupies the rebellious cachet that rock and roll had for Baby Boomers. We’re dropped in the middle of a Legion that already has twenty members, so those wanting to spin up to speed slowly have some remedial Silver Age reading to do. Waid has already done the "three teens meet and form a super-club" story in the 1992 reboot, so it makes sense for him to skip ahead this time. I don’t know much about Bart Allen, but I gather that he’s from the 31st century, and his mom is a cop? Giffen had been using nine-panel grid before Watchmen, so I don't think that had anything to with what he was doing here. By this time, though, I was Legioned out and couldn't get excited about any of these books. Too bad, too, because Al Gordon was the best inker Giffen has since Oksner. Creative Team: Mark Waid writing. Barry Kitson pencils. Kitson and Mick Gray inks. The Story: A four page prologue blitzes through the history of humanity, showing conflicts from the Roman era through World War II (Hi, Sgt. Rock!) before zipping on to a 31st century as peaceful as it is stifling. Then come four pages with chest-up up portraits of 15 legionnaires, explaining their code names, powers, and homeworlds. The main differences from the Silver Age versions so far are that Karate Kid is Eurasian, and Star Boy is black. Chameleon Boy is genderless Chameleon, as seen in the previous reboot as well. Cut to three pages of exposition between two members of the Science Police, discussing how the twenty super-powered legionnaires are just the core of a youth movement which has 75,000 estimated members throughout the United Planets. The SPs are disgruntled that the Legion has been “endorsed” by the United Planets. As we’ll soon see, Legion/U.P. relations are not really as rosy as all that. The two SPs are in the same room but are uncomfortable facing each other, because this society has become too used to Skyping. So there they are, back to back, looking at each other on their data tablets. In 2005 this seemed far-fetched; now it seems more like a documentary. Many American kids today are far more comfortable interacting online than they are getting together in person. Half a dozen legionnaires finish defeating a giant robot in some city plaza, then bicker with Science Police officers and banter with each other. Next it’s off to the plaza surrounding Legion HQ. It’s filled with hundreds of teen admirers forming a human shield to prevent the Science Police from demolishing the Legion building. Crisis time! A Legion taskforce races through the transmatter portal to emerge on Lallor. Seems the army is assaulting teenagers for some reason, and the United Planets, fearful of offending non-member planet Lallor, orders the Legion not to intervene. Do they intervene? Yes, they do, with brio. My Two Cents: The first issue of a sci fi story can be mainly about character or mainly about world-building. Waid opts mostly for the latter, dropping us into the thick of a world already in progress and embroiled in several layers of conflict. His characters overflow with breezy banter which owes a lot to the jokey dynamics of Joss Whedon’s TV show “Buffy the Vampire Slayer.” The characters are all equally funny but not yet differently funny according to their individual quirks. The Legionnaires are all pop culture junkies who lounge around in their clubhouse, playing foosball and reading vintage DC Comics. The throng of fans outside their doors strongly recall the “mutant chic” concept that Grant Morrison concocted in New X-Men a few years before this. The fans wear their favorite superhero emblems and debate about which heroes are the coolest. We get the first instance of the gag that “Colossal Boy” is now a giant (from “Big City” we’ll later learn) whose power is to shrink to human size. Cute, though the gag gets repeated in future issues long past the point of being funny. Lallor, site of the big battle in this issue, was first introduced in Adventure Comics #324 (1964) as the home of the “Heroes of Lallor” who included Duplicate Boy. But those heroes don’t appear in this issue, and we don’t learn anything about Lallor beyond the questionably motivated assault on its civilian teens by its army. This is far from my favorite Legion incarnation, but it still has its good points. You're right about young people being so used to online interaction that they're not comfortable talking face to face. I do get a kick out of that page. I do think the generation gap angle got way overplayed in this series. One little thing that drove me crazy about this Legion is making Colossal Boy a giant who has the ability to shrink to 6 feet. That's just silly, that's a write trying to do something clever and different, and failing. It adds absolutely nothing. OK, that's a bit of a rant over a relatively minor point, but I just find that really annoying. Total agreement here. Was OK in a try to find a new hook way but it didn't really do much for me. I am too vested in the "original" LOSH from over the years. This version might catch newer and younger readers that don't have the connection or love for the LOSH but it was likely never going to last overly long as a regular series. Personally I think Waid was trying too hard to get younger readers attention with some rather tired and old concepts. Youth versus adult generation gap, heroes as rock stars, a Giant that actually shrinks, the team as more of a "club" and such just wasn't all that interesting to me and other readers? Exactly! In addition, there are very, very few optimistic futures in the world of sci-fi. Most sci-fi futures are dystopian. Star Trek and the Legion of Super-Heroes are about the only optimistic futures I can really think of. to be fair, though, this isn't the first pessimistic Legion, since I'd say the 5 Years Later Legion was pretty depressing, but like you say, a lot of Waid's choices just didn't work for me. I'm an old school Legion guy. If Waid thought he was going to lure newer and younger readers, he was dreaming. I suspect he wasn't, since he started with a twenty member Legion, which would be quite alienating to newbies. I wish Grant Morrison had explored the "heroes as rock stars" idea more in X-Men. Waid does something with it, but as we'll see he doesn't come back to it often enough. Likewise "youth vs adult" comes in and out of the story and seems more like a Baby Boomer attitude. Creative Team: Mark Waid writing. Barry Kitson pencils. Kitson, James Pascoe, and Mick Gray inks. The Story: A squad of Legionnaires foils a plot to assassinate a bunch of United Planets ambassadors. Fun times. Dream Girl’s home planet of Naltor has a crisis. Teenagers are going crazy from extreme insomnia. Turns out it’s the fault of grown-ups, who are preventing the youth from sleeping so that they won’t have access to precognitive dreams about the doom and gloom of widespread war awaiting them. As if going nuts from lack of sleep is better?? Dream Girl rips out the guts of the sleep-deprivation machine. Braniac 5 hopes to avert the catastrophe she foresaw. My Two Cents: The personalities of individual Legionnaires are beginning to emerge. Shadow Lass is a ninja. Dream Girl’s precognition leaves her in a ditzy haze much of the time. In this issue, she’s blonde, but not platinum blonde. Colorist error? Element Lad is a mystic, preoccupied with deep thoughts about the meaning of “change.” Braniac 5 is constantly irritated at having to hang around lesser intelligence, and especially irate that Dream Girl steals his predictive thunder so frequently. Waid leaks out more world-building exposition, as well. The galaxy-wide nanny state has all teens and children constantly monitored by the euphemistically named Public Service which allows their parents not only to track them at all times but also to control their minds to some degree. Braniac 5’s Legion flight rings make the wearers immune; ergo Legionnaires are in violation of both the laws and the mores of their society. Between this and the “grownups say no dreams on Naltor” plot of this issue, Waid is hitting heavy on a “generation gap” theme that would have made a lot of sense for Legion stories told in the late 1960s when Baby Boomer youth culture was in ascendance. There’s also a fun duel between Karate Kid, Shadow Lass, and two Naltorian “precommandos” whose ability to see seconds into the future makes them unbeatable in melee combat.